Anchorage developer J. Jay Brooks owns a 10-acre property with a trailer court off Arctic Boulevard and 36th Avenue in Anchorage, at the place where Spenard meets Midtown. Brooks has ideas for the land. He wants to transform it into a blend of dense, compact apartments on top of restaurants, close to sidewalks and bike paths connecting to Anchorage's famous greenbelt system. "That's been on my radar screen," said Brooks, who developed the popular Rustic Goat restaurant and apartments in the Turnagain neighborhood. It's also not allowed under current city zoning laws. 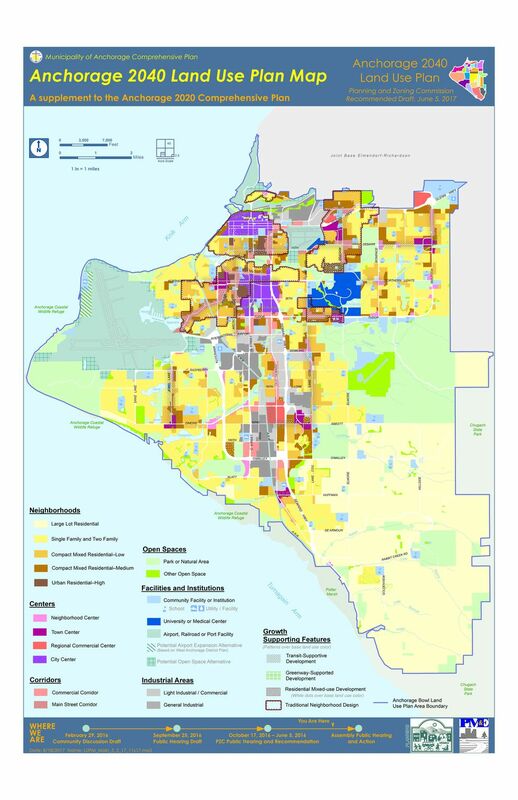 But a landmark document now before the Anchorage Assembly aims to help Brooks and others move forward with similar ideas, because it's where city planners see the urban parts of Anchorage heading. 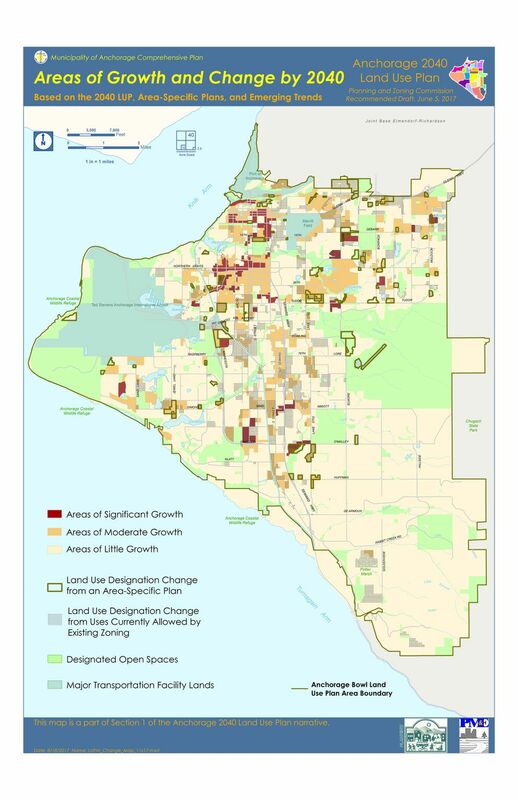 The document, the Anchorage 2040 Land Use Plan, is a road map for how Anchorage will grow and develop in the next two decades. City officials will consult it when making decisions about zoning. Maps included in the plan show compact developments of apartments on top of stores and offices, common in cities throughout the Lower 48 but rare at the moment in Anchorage. Those developments would go in urban centers — downtown, Midtown, Muldoon and Fairview — with larger lots and single-family homes emanating out toward the Hillside and South Anchorage. If it isn't adopted by the Assembly, planners expect more land shortages, higher costs and lower land values over time, said Thede Tobish, a senior planner for the city. For all the time and energy poured into similar plans over the years, Anchorage is not known for following them. The city has largely evolved around boom-and-bust cycles with little regulation. The map that serves as the city's current foundation for zoning decisions hasn't been updated since 1982, though some neighborhood-specific versions have been adopted over the years. But the new plan appears to have some teeth, as city officials warn of the looming scarcity of land in the Anchorage Bowl. The document includes a checklist of actions to pursue. • The creation of "reinvestment focus areas" where the city would take the lead on rezoning entire areas, with the aim of spurring housing and commercial construction. The document identifies several leading candidates: The Central Spenard area between Spenard and Arctic Boulevard, including J. Jay Brooks' property; the western part of Fairview; and the south end of downtown. Right now, the city generally waits on developers to apply to change a land use. Here, the city would be the applicant, with the support of the property owners. • Regulations to allow "mother-in-law" apartments — separate apartments attached to an existing house — and other types of compact housing, such as cottages with shared courtyards, townhouses, small-scale garden apartments. • The incorporation of greenbelt connections into redevelopment projects, such as the Central Spenard area, and more planning for transit corridors. • An emphasis on making sure denser developments fit in with Anchorage's neighborhoods, which vary widely in character. As senior city planner Tom Davis put it: The suburban cul-de-sacs of Southport, in South Anchorage, look markedly different from the gridded, walkable patterns of South Addition near downtown, and from the more rural large lots of the Anchorage Hillside. Over the next decade, the document also directs planners to examine the extension of public utilities to support more compact developments and work on resolving land use and ownership conflicts with Ted Stevens Anchorage International Airport. Nothing changes immediately if the Assembly adopts the plan. But it's a blueprint for the future, Tobish said. Some of the "action items" will require money. Tyler Robinson, the chair of the city Planning and Zoning Commission, said planning commissioners were wary of setting goals that the city's resources simply don't allow for. But Robinson, who is also the director of developing, planning and finance for Cook Inlet Housing Authority, said it's necessary for the city to take a more active role in facilitating development, including the construction of roads, sewers and other infrastructure. "Without the city's involvement, it's not going to happen," Robinson said. "You can't improve public places on the backs only of the private sector." A huge portion of the new land use document is centered on places for people to live. With the city hemmed in by Cook Inlet on one side and the Chugach Mountains on the other, Anchorage planners predict a housing shortfall for several thousand people by 2040, even amid the state's current recession and the city's stagnating population. It's hard to predict the future, Davis said. He said Anchorage's biggest policy risk is to expect too little and underestimate the demands for land and housing. But by 2040, more people are expected to be downsizing, making a moderate income or looking for a "starter home," leading to the city's interest in more innovative, small-scale housing models. In the Central Spenard area identified by the city as a leading candidate for revitalization, Cook Inlet Housing Authority is now leasing apartments on top of commercial space at the corner of Spenard Road and 36th Avenue. That type of development has become more prominent only in the past few years, helped by regulatory changes. The administration of Mayor Ethan Berkowitz recently hired a chief housing officer to start to push similar projects. Displacement of lower-income residents from mobile home parks is likely to become more common, and the new land use plan calls for finding ways to ease that transition. Brooks' company, Midtown LLC, has strategically bought most of the mobile homes in the trailer park. A lot of them are in really bad shape, Brooks said. He said he expects his project to unfold over a decade. But he thinks the property is one of the largest developable sites in Midtown. He's hoping the city will pitch in to help develop bicycle trails, sidewalks, water and sewer, storm drainage and lighting. "Hopefully this is just one step in that direction," said Brooks, speaking of the new land use plan. "There's a long way to go." The Anchorage Assembly is expected to hold at least two work sessions on the new land use plan this month. A public hearing date in the Assembly chambers has been set for Sept. 26. Find the full document and other information online on the city planning department's website.